Grab your Garden Hat, sip on mimosa's, tea and enjoy as we brunch and chat in celebration of Mother' Day! Great way to spend the day before Mother's Day with your mother's, daughters, aunts, sisters, grandmothers and friends. K OF C FAMILY FUN NIGHT! BRING THE FAMILY! JOIN THE FUN! The 22nd of the month holds a special significance in the life of the Maronite Catholic Church with devotion to Saint Sharbel Makhlouf. In Lebanon and throughout the world, hundreds and thousands of people gather on the 22nd to commemorate the anniversary of the miraculous healing of Nohad El Shami on January 22, 1993 through this Saint’s divine surgical intervention. This year marks the 26th anniversary of this miracle! As we continue our devotion to Saint Sharbel on the 22nd of every month, a Healing Mass with the Relics of Saint Sharbel will be celebrated as scheduled on Tuesday, January 22, 2019 at 6 PM with Bishop A. Elias Zaidan, Eparchy of Our Lady of Lebanon Los Angeles! We are pleased to receive His Eminence Gabriel Issa, Ambassador of Lebanon for the United States, on Tuesday, January 22, 2019. A reception in his honor will follow the Divine Liturgy. Additionally, we are honored to receive The Consul General of Lebanon in Detroit, Mrs. Suzan Mouzi, who will also share in our festivities. Please keep our beloved Patriarch Rai in your prayers for healing. Come join us in our St. Sharbel Banquet Hall for our New Year’s Eve Family Party! We invite all of our Youth ages 12-18 to join us for our annual Christmas Celebration as we enjoy lunch together. This year we are so excited to welcome our Guest Speaker Maronite Seminarian, Chris Nahra! This event will take place at the Church and all Youth are welcome. Please join us on Saturday, December 15, 2018, for an Advent Retreat that is sure to maximize your Emmanuel experience. Jesus Christ is our HOPE and because He brings JOY into our hearts we can better know our steadfast Lord infilling us with LOVE and overwhelming PEACE. Come join us for our annual Christmas Luncheon sponsored by the Ladies Altar Society. Tickets can be purchased after mass $20/ticket. We will start off the day with liturgy at 11:15 am followed by a Christmas lunch catered by LaSaj Lebanese Bistro at 12pm. We hope to see you there! All parents of youth ages 12-18 are welcome to join us for our meeting about our annual MYO Regional Retreats. We are so honored to be hosting the retreat in February 2019 at our new parish St. Sharbel for the first time! Come learn more about the retreat, pricing and how to register your kids! The meeting will take place following 11:30 liturgy on Sunday, December 2nd. Come join us for our Annual Friendsgiving Potluck at our parish St. Sharbel. Please Click Here to RSVP and sign up to bring a dish! The MYA team cordially invites you to an exciting night with delicious food, enjoyable company, and humble gratitude, as we celebrate Thanksgiving! Come join us for a Friendsgiving Potluck Dinner and feel free to bring a dish with you! Please RSVP to Amanda Abi-Samra at 586 464-7175 or email saintsharbelmya@gmail.com! 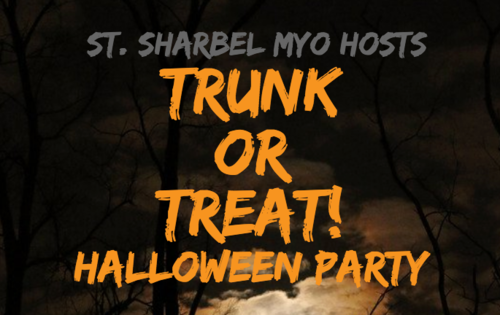 St. Sharbel Church invites you to a get together for a night of games and food! $10 Includes pizza, snacks, and beverages. Bring your own cards! Please support the Ladies Altars Society Bake Sale on Saturday and Sunday, October 13-14, 2018 by purchasing or donating sweets. To order meat or spinach pies at $15 dozen, please call Donna at (586) 552-3620. Come join us for our Family Fun Day at Blake’s Big Apple Orchard! Everyone is welcome, please bring your family and friends! It is $15 per person and you can pay when you get there (please bring exact change). We will meet at the Cider Mill at 2 pm. Hope to see you there! Please reserve your spot and RSVP to Amanda Abi-Samra (586) 464-7175. Join us in the Celebration of our Divine Liturgy to Consecrate our new home! Advanced ticket sales of $100.00 includes premium open bar, hor d’oeuvres and multi-course dinner. Come tour the Church, our beautiful grounds, enjoy a glass of wine and hor d’oevours. Join Bishop Zaidan and Bishop Mansour in Celebrating the Divine Liturgy as we welcome the Board of Tele Lumiere / Noursat to Michigan!